An article by Ruth Fraňková on Archaeologynewsnetwork - Shapely Czech Venus Reveals Secrets - reports on the recent scan results of the Dolní Věstonice figurine from the Moravian Museum in Brno. 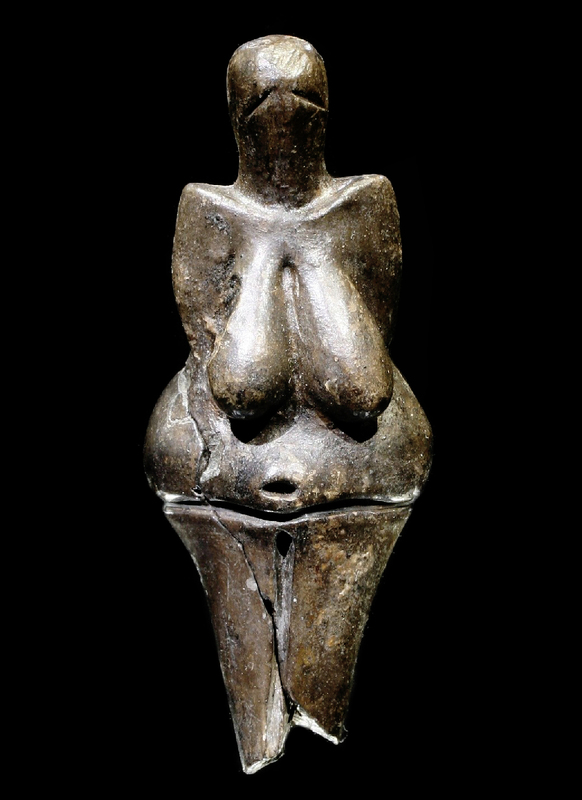 The Dolní Věstonice ceramic figurine, believed to be 29,000 years old. The Dolní Věstonice 11.5 cms tall ceramic figurine, believed to be 29,000 years old, has gone under a detailed scan in a 3D microscope. The microscope, located in Brno's FEI Technological Institute, was able to map all the particles within the statue in microscopic resolution. One of the biggest discoveries was that the figurine was not made of two or more pieces of clay, as it was initially expected, but was evidently created from one single piece. Researchers were also able to determine the composition. Petr Neruda, a curator at the Moravian Museum in Brno, revealed that the impurities within the sculpture are quite randomly distributed, showing that the material - charcoals, bone fragments and parts of mammoth ivory - came from the site where it was created. It was made in situ. It has been thought that the sculpture's head was originally ornamented with four feathers. Analysis now shows that the holes were produced by one tool with a relatively sharp tip, resembling the point of bird feathers. It may be possible to identify which bird species feathers were used. The ceramic figure was discovered in South Moravia in July 1925. The figurine, broken in two pieces, was found amongst the remnants of a prehistoric fire pit once used by mammoth hunters. It had been made by burning the clay, a technology commonly used only in the later Neolithic period. This research may eventually shed light on the purpose of the sculpture. Editor's note: It is good to see the investigation of the Ice Age sculptures taking place on a forensic scale. New insights will follow. To augment this, I would only add that contemporary artists - sculptors - should be included in the discussions. What and where is Dolní Věstonice?